The man accused in Friday's horrific killing and carjacking spree near Sacramento, Calif., which resulted in the deaths of two sheriff's deputies and the wounding of two others, is a citizen of Mexico who was deported twice previously, but who apparently has been living in the United States for more than a decade. Thanks to fingerprint sharing made possible by ICE's Secure Communities program (which DHS Secretary Jeh Johnson has indicated he wants to scale back), authorities were able to quickly determine that the man arrested had given them an alias. ICE has issued a statement saying that the accused is Luis Enrique Monroy-Bracamonte, and that he was deported in 1997 after a conviction in Arizona for possession of narcotics for sale, and again in 2001. Unfortunately, the Secure Communities identification system seems to be the only part of our immigration system that has worked properly against this violent criminal. According to news accounts, after he illegally re-entered the country after deportation, Monroy-Bracamonte lived and worked for years in Arizona, where he married Janelle Marquez Monroy-Bracamonte, reported to be a U.S. citizen. At some point they moved to the Salt Lake City, Utah, area, which is notably more hospitable to illegal residents. While working as a house painter and lawn mower there, Monroy-Bracamonte apparently racked up more than 10 misdemeanor traffic offenses and citations between 2003 and 2009 under an alias. In addition, he reportedly had a record of one traffic ticket and three small claims court filings for debt in his real name, also in Utah. Had these offenses occurred in Arizona or other places where local law enforcement agencies are encouraged (and required in Arizona since 2012) to look into the identity and immigration status of lawbreakers, Monroy-Bracamonte might have come to the attention of local police and ICE a long time ago. But Salt Lake City Police Chief Chris Burbank has said such policies are "ridiculous" and "you actually increase crime when you enforce these kinds of laws." Who looks ridiculous now? Chief Burbank also has been active with a (very small) group of police chiefs lobbying against immigration enforcement and for amnesty. Monroy-Bracamonte appears not to be your average illegal worker off on a weekend road trip with his wife. They were quite well armed for their trip to Sacramento, packing an AR-15 assault rifle and at least two pistols. Monroy-Bracamonte killed Sacramento County deputy Danny Oliver by shooting him in the forehead as he approached their car, which was parked in the lot of a Motel 6 that is notorious for criminal activity, and where they were registered as guests. 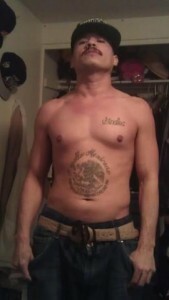 They led officers on a six-hour chase, during which Monroy-Bracamonte killed detective Michael David Davis, Jr., and wounded two others before officers used tear gas to smoke him out of hiding in a house in Auburn, Calif.
Photographs reported to be of Monroy-Bracamonte suggest that he is a member of the criminal gang known as Mexican Pride and associated with the Sinaloa drug cartel. Mexican Pride has been on ICE's radar screen for some time. Dozens of Mexican Pride members and associates have been arrested by ICE agents over the years, and the agency's arrest records show concentrations in Arizona, southeast Washington state, Colorado, and the Washington DC/Northern Virginia metro area. Mexican Pride members often have violent criminal histories, including assault, weapons offenses, drug dealing, burglary, robbery, and more. Federal gang intelligence reports say Mexican Pride is also involved in prostitution and human trafficking. The gang's membership includes Central Americans as well as Mexicans and U.S. citizens. Unfortunately, ICE leadership under the Obama administration has pulled back on ICE's highly effective anti-gang programs in the last few years, and American communities – and families – are now paying the price. ICE's National Gang Unit records show that 20 percent fewer gang arrests were made in 2013 than in 2012. And more and more of the ICE gang arrests have been occurring overseas rather than within the United States. Whereas ICE agents once could work closely with local law enforcement agencies to target deportable gang members pro-actively with surge and street operations, now policies from ICE headquarters dictate that gang members are off-limits for enforcement until they are convicted of a serious crime. The result is that foreign gang members now can more easily avoid arrest, have little fear of immigration enforcement, are more likely to obtain benefits or relief from removal, are much less likely to face deportation, and are more likely to return after deportation. Liberal ICE detention policies have led to the release of gang members arrested by ICE investigators, which can enable them to escape prosecution. ICE agents also face limitations that are stricter than most other federal and local investigators on how they may use social media; such tools might well have enabled ICE to target Monroy-Bracamonte earlier. Has Luis Monroy-Bracamonte had other encounters with immigration authorities since his removal in 2001? What are the circumstances of his 2001 removal? Did it follow another arrest, and which agency made that arrest? Did Janelle Marquez Monroy-Bracamonte (or anyone else) seek to sponsor Luis for a green card? Has he received any immigration benefit or exercise of prosecutorial discretion? Law enforcement agencies should be asked to disclose Monroy-Bracamonte's entire criminal history and record of civil infractions and charges. Does Janelle Monroy-Bracamonte have a criminal history? What identification documents did Monroy-Bracamonte provide to the officers who arrested him? Did they include a legally issued driver's license that he obtained in Utah or another state? Or did he use fraudulent documents? Did any Utah law enforcement officers ever inquire or investigate his identity or immigration status? If so, was he referred to ICE? The answers to these questions may guide lawmakers and local law enforcement agencies to adopt, or reinstate, more effective enforcement practices that prioritize public safety over protecting criminal aliens.